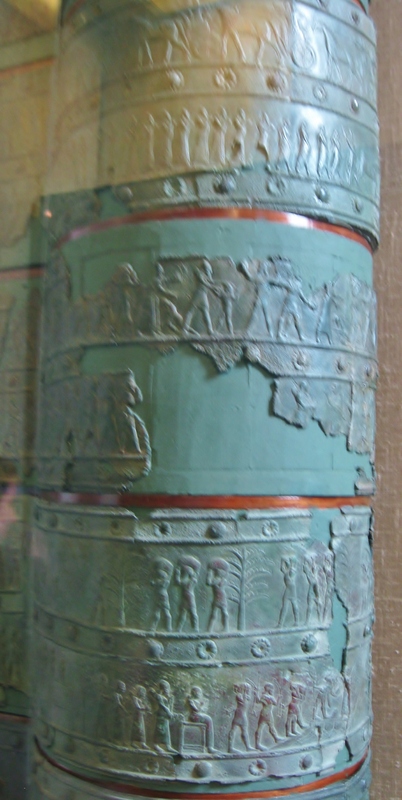 In April of 2013 I published on this blog a photo essay highlighting some of the many Assyrian antiquities in The British Museum (here is the link: https://clioantiquities.wordpress.com/2013/04/13/a-sampler-of-ancient-assyrian-art-at-the-british-museum/ ). Little could anyone have known at the time that a gang of fanatics and thugs, referred to now under the English language acronyms ISIS or ISIL, would take control of swaths of Syria and Iraq that include the ancient Assyrian heartland. 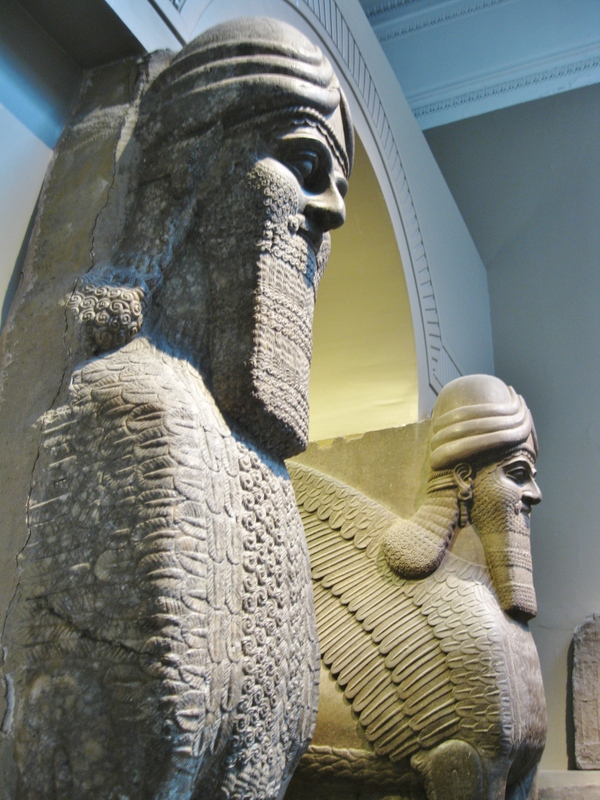 Reports are sketchy but it is clear that in addition to Christian and Yazidi monuments and art works and those of other Islamic sects ISIL finds objectionable, ancient Assyrian, Neo-Hittite, Roman and Byzantine monuments and antiquities have been destroyed. This has occurred both in-situ and in museums. 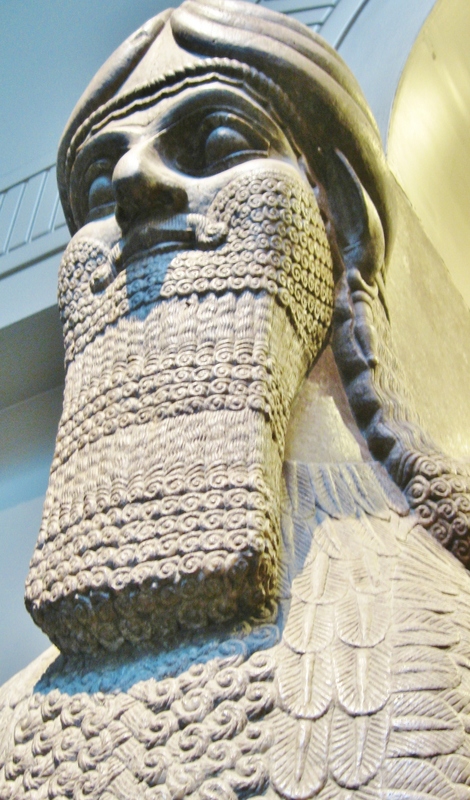 Those who call for blindly repatriating ancient works of art from western museums to their source countries in the name of some form of political or cultural correctness should consider the fate not only of ancient Assyrian art in Iraq and Syria but also ancient works in many other conflict zones around the world. Attacking collectors, auction houses and art dealers, the overwhelming majority of whom are ethical and do not traffic in looted material, is an absurd gesture that utterly fails to address the root causes of looting and destruction. In the long term, many legally acquired antiquities circulating on the market today will find their way into public museum collections. Great museums in stable nations provide a venue for visitors from all over the world to see these works, which are mankind’s cultural legacy, not just those of a single modern nation state with artificially drawn borders whose modern populations have, in many cases, little or nothing to do with those that created the ancient works they have inherited. With so much ancient Assyrian art now at risk, I would like to expand upon that original blog post and share more images of the British Museum’s Assyrian collections (and one image from the Ashmolean Museum in Oxford) and more textual detail on the previously published images. 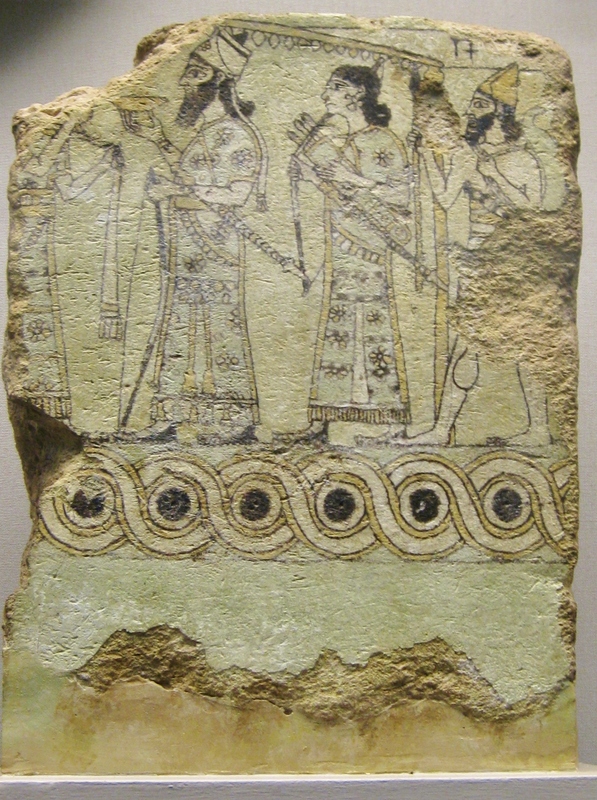 All images should be credited to Clio Ancient Art and Antiquities. For those wishing to see Assyrian art at locations other than The British Museum, I recommend visiting The Louvre in Paris, The Vatican Museums in Rome, The Metropolitan Museum of Art in New York and The Oriental Institute at the University of Chicago. On the US west coast, the Los Angeles County Museum of Art and the Fine Arts Museums of San Francisco also have some examples on view. Glazed terracotta tile. Nimrud. 875-850 BC. 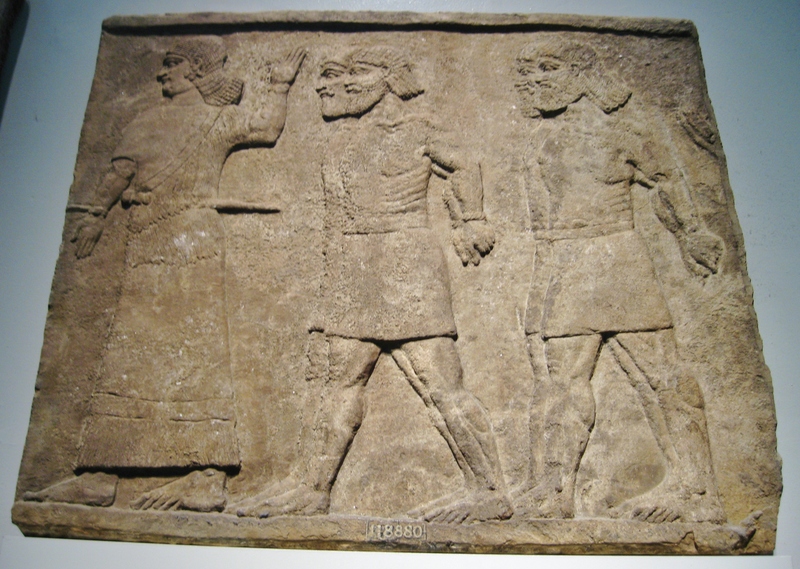 An Assyrian king, holding a cup in one hand and bow in the other, is accompanied by his bodyguard. This is a ceremonial image intended to show the king as both warrior and hunter. 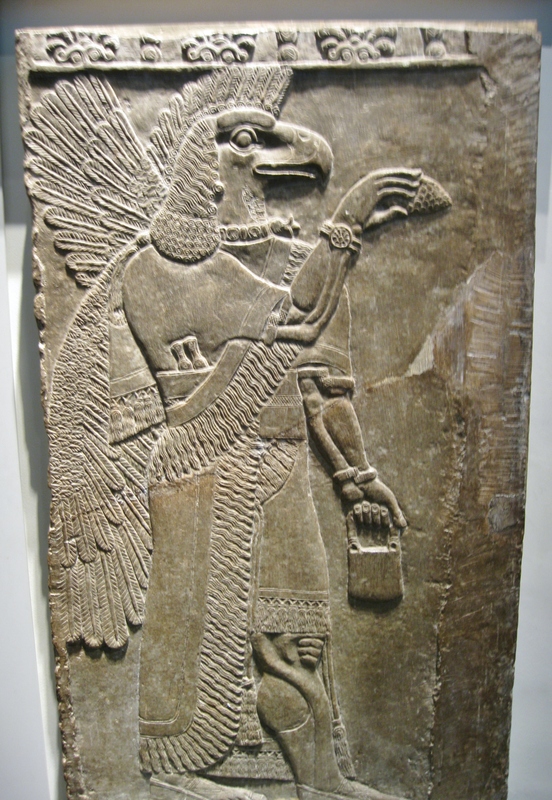 Eagle headed protective spirit from the Temple of Ninurta at Nimrud. 865-860 BC. He carried a pale of holy water and a pine cone with which to sprinkle the water in a gesture of purification, rather like holy water used in some modern Christian denominations. Captured flocks of sheep and goats, taken during Tiglath-pilesser III’s campaign against the Arabs, are driven back to the Assyrian camp. From the Central Palace, Nimrud, about 728 BC. Stela of King Shamshi-Adad V, 824-811 BC. It depicts the king before symbols of his principal gods. He extends his right hand, with the forefinger outstretched, an Assyrian gesture of respect and supplication towards the gods. 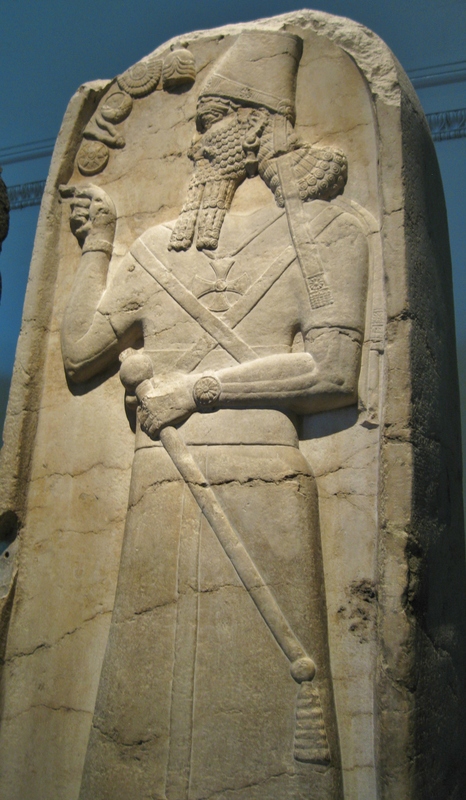 The gods could be worshipped in symbolic form and here are, from top to bottom, Ashur, Shamash, Sin, Adad and Ishtar. The king wears a large symbol resembling a Maltese cross on his chest, another symbol of the god Shamash. Partial reconstruction of the Balawat Gates. Erected by King Shalmaneser III at his new palace at Balawat between 858 and 824 BC. The gates were constructed of wood with bronze reinforcing strips. Only the bronze strips have survived. They showed scenes of conquest and tribute with Cuneiform captions. Remarkable scene of the Assyrian assault on a fortified city. This relief, from Nimrud and dating to 865-860 BC, depicts a remarkable armored tank-like siege machine on wheels, using what appears to be a metal tipped wedge or ram to work loose the blocks in the city wall. Assyrian archers are shown in their characteristic formation of pairs, with one man using a shield to prove cover while another lets loose his arrow. A pair of winged human headed bulls from the NW Palace at Nimrud, 865-860 BC. These guarded what may have been the entrance to the King’s private apartments. Detail of one of the winged human headed bulls described above. 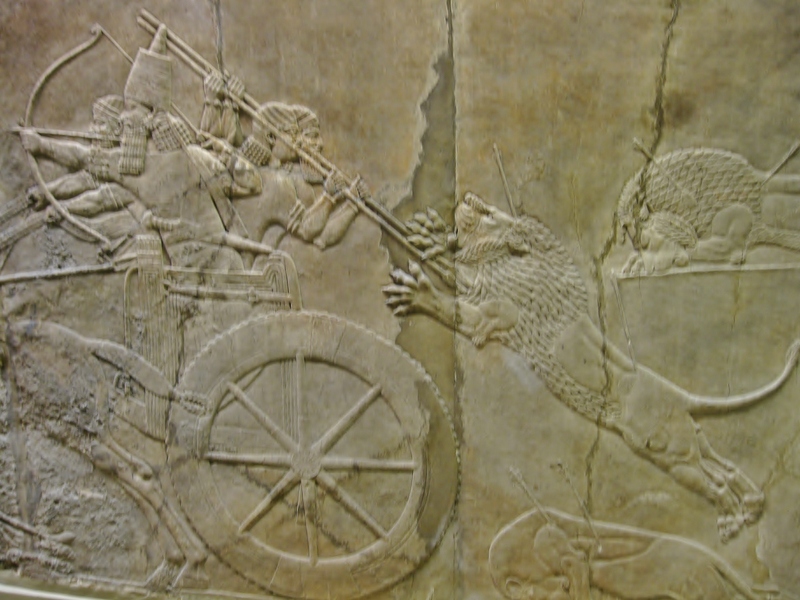 Ashurnasirpal in his chariot, aiming an arrow at a lion while his attendants fend off a lion behind. 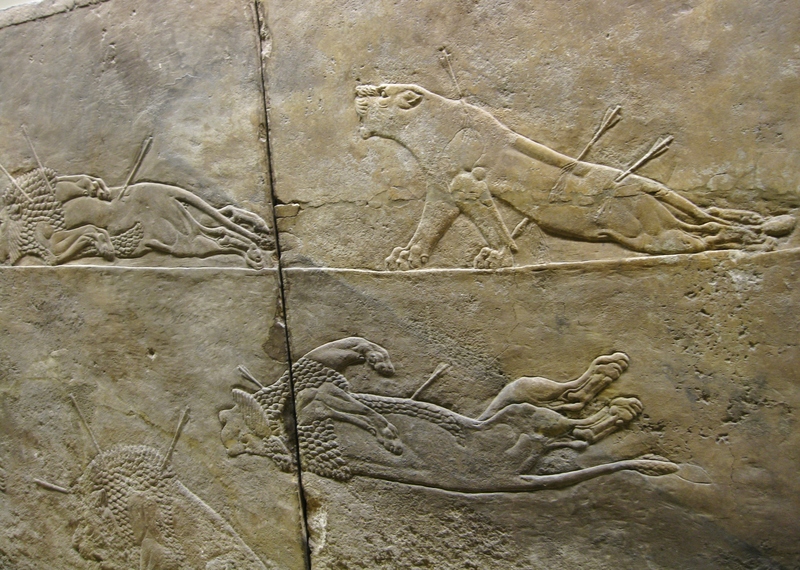 This and the next image, the famed “Dying Lioness”, are part of a lengthy series of panels showing wild animal hunts from the North Palace at Ninevah, 668-627 BC. Lions were common in the Near and Middle East at this time and hunting them, and other animals considered fierce and powerful, was part of a long tradition in region to display the King’s prowess, bravery and skill. This poignant image has come to be known as “The Dying Lioness”. It is part of the animal hunt sequence from the North Palace at Ninevah, 668-627 BC. The lioness has been partly paralyzed by arrows in her hind quarters and drags herself forward to snarl at her attackers. 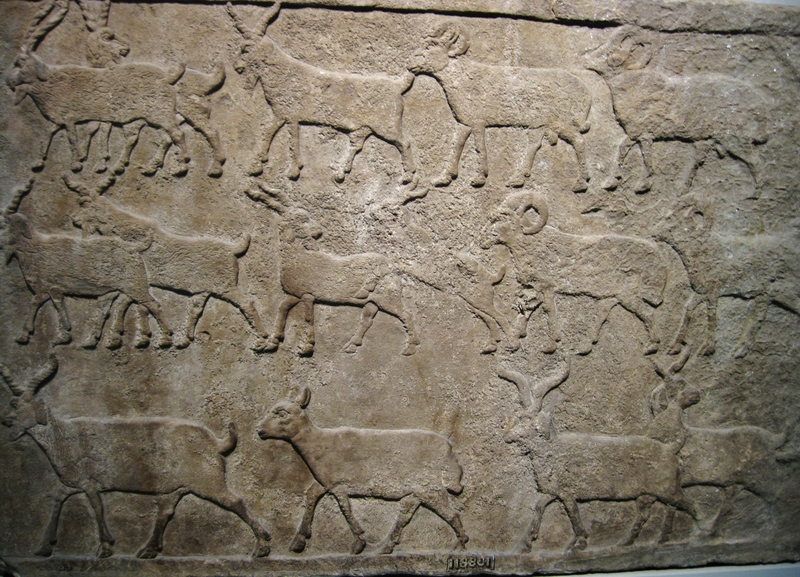 In another scene from the Nineveh animal hunt panels, deer are trapped by herding them into a high net enclosure. As no weapons are depicted here, the animals may have been intended for a private zoo or park on the royal estates. 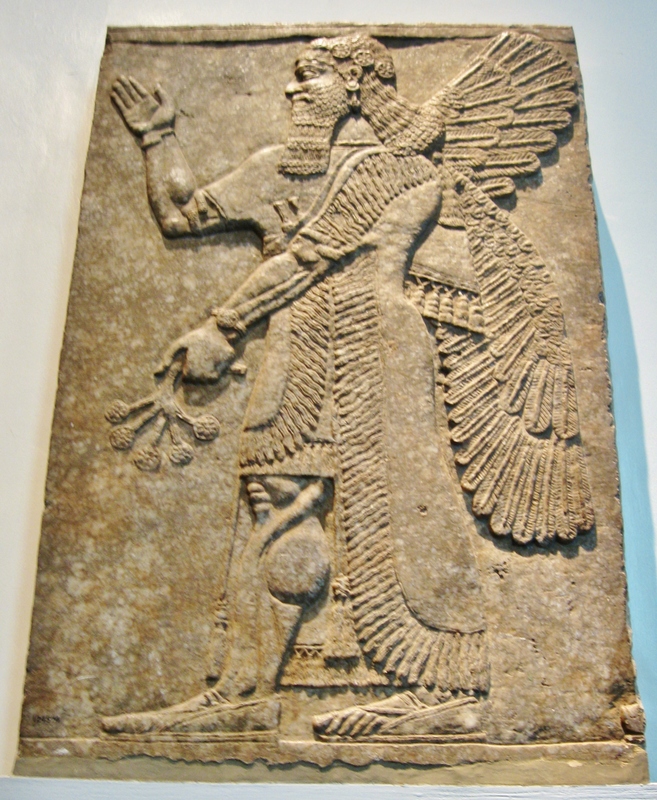 Assyrian winged genius from the Palace of Ashurnasirpal (883-859 BC) at Nimrud. Acquired through excavation by A.H. Layard in the early 19th Century. Now in the Ashmolean Museum, Oxford.